I have Windows SBS 2011 running on a virtual machine, hosting an Exchange 2010 server. It has worked for years without issues, but a couple weeks ago something happened and I'm no longer able to log into the EMC. This isn't our primary email service, as we only use it for some internal application, but it's still causing a lot of headaches for me. The attempt to connect to using "Kerberos" authentication failed: Connecting to remote server failed with the following error message: The WinRM client cannot process the request. It cannot determine the content type of the HTTP response from the destination computer. The content type is absent or invalid. For more information, see the about_Remote_Troubleshooting Help topic. I've found a number of different articles about this issue, and they all seem to have slightly different answers for different situations, but none have worked for me. Looked at the registry settings under HKEY_LOCAL_MACHINE\SYSTEM\CurrentControlSet\services\HTTP\Parameters to make sure the decimal sizes are big enough. I'm not sure where to go from here. Any advice would be greatly appreciated. 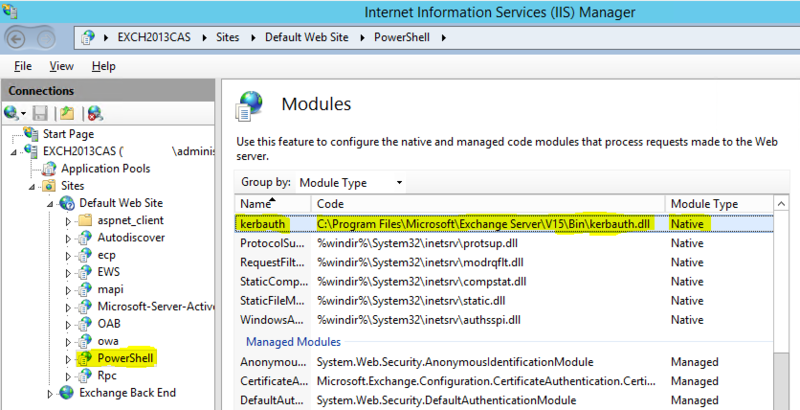 In IIS manager, the Kerbauth module is not enabled on the default web site, but in the PowerShell virtual directory, the module type is Native and the DLL location is C:\Program Files\Microsoft\Exchange Server\v14\Bin\kerbauth.dll. Figure as below: Note: my lab is Exchange 2013. I've just solved this for myself and it may be that it will help everyone else - I was resigned to having to do a rebuild. Turns out to be something very simple - I had hardened my IIS setup and that's when things went awry. Simple fix = go into IIS manager, under default website select powershell folder. in the options double click authentication and make sure that ASP .Net impersonation is switched off. You don't even need to restart, worked straight away for me both EMS and EMC working perfectly !! Hope this helps all those stuck with this. Not the answer you're looking for? Browse other questions tagged exchange-2010 windows-sbs-2011 or ask your own question.